ReVision LASIK & Cataract Surgery takes pride in fostering relationships with Optometrists in Central Ohio. We are fortunate to work closely with several outstanding Optometrists and their teams on a daily basis. Working together, our practices provide the highest quality of pre and post-surgical vision care possible to each patient. Dr. Zehnder and his team at Advanced Eyecare Associates in Delaware, Ohio are a key partner in ReVision’s success. Our doctors and staff work closely to build trust and strong relationships. When ReVision learned a longtime team member of Advanced Eyecare Associates was in need of support, we wanted to help. Rose Brooks has been an Insurance Administrator at Advanced Eyecare Associates for 6 years. She is an amazing human and friend to everyone. Unfortunately, a few months ago Rose received heart-wrenching news. Her daughter, Debbie, was unexpectedly diagnosed with cancer. Like Rose, Debbie is a strong, vibrant woman. During a routine check-up at the end of June, a small area of cancer was found in Debbie’s stomach. She was told removing the cancer was her best option. Surgery was scheduled a few weeks later and doctors discovered the cancer had spread. It was now uncontrollable. Debbie was diagnosed with Stage 4 cancer and given a life expectancy of less than 12 months. As her mother, Rose was devastated but is fighting for her daughter to have the best chance for survival at An Oasis of Healing; a treatment facility in Arizona. Rose and her family have helped raise thousands of dollars to contribute to the cost of Debbie’s medical care not covered by insurance. 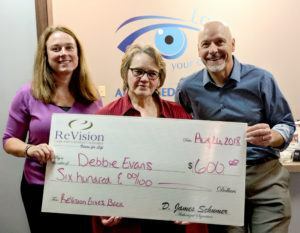 Through the ReVision Gives Back program, ReVision LASIK and Cataract Surgery is proud to make a donation to support Debbie’s battle against cancer. ReVision stands with the Advanced Eyecare Associates team to support Rose and her family in finding a cure for a disease that affects the lives of so many.